Kitchen Confidential: Adventures in the Culinary Underbelly by Anthony Bourdain was a bestselling autobiography from 2000 that covered a lot of ground, including: Bourdain's path to becoming a chef and then experience in the industry, what the kitchens he worked in and the people he worked with were like, how difficult the business can be, what's required to do well and how for Bourdain and many others who succeed against long odds, it really is about the food. There's a lot of fascinating and at times salacious stories of the restaurant business and people in it, but the chapter that resonated the most with me was on his former boss who he referred to as Bigfoot. As a manager of Bourdain and many others, he was extremely demanding and on top of all aspects of his business and in working with employees, what mattered to him was character, people showing up early, doing what they say they will and being willing to do whatever's needed. 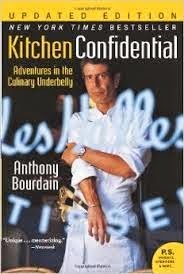 Bourdain wrote of the impression that Bigfoot and his approach made on him and wrote multiple times throughout the book of how he could train people to cook, or do any aspect of the business, so what he valued the most in employees was dependability, people who were always there, would listen and do what was asked. All in all, it was a good book and it's understandable that Bourdain has succeeded with the work he's put in.